Before I married a mechanic, I definitely didn’t know how to make the most of my appointment with an auto mechanic shop, making it a stressful experience. Now that my husband and I own a shop, I’d like to share with you some things I’ve learned that will save you some of the frustration I used to experience. While some larger shops or dealers are equipped for walk-ins, many shops, especially small independent shops like ours, can better serve you if you schedule an appointment – even for something minor like an oil change. This allows them to make you and your car the priority when you arrive. 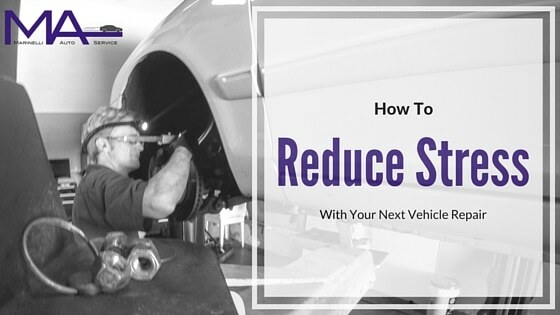 The shop can then prioritize adequate time for your vehicle’s service and manage the work-flow of each vehicle in the shop. So, call a few days ahead, schedule an appointment, and allow some time to fill out paperwork and discuss the vehicle and expectations for the service. Just like at your doctor’s office, repair shops understand that urgent situations arise suddenly. They will often find wiggle room in their schedule to take on urgent situations such as no-starts or safety concerns, so don’t panic. We want to work with you to get you back on the road as soon and as safely as possible. If something comes up and you can no longer honor the appointment, whatever the reason, call to cancel in advance. Give as much time as possible – 24 hours at the very least. Aside from just being good manners on your part, this allows the shop to schedule someone else in that time slot. When an appointment is missed without a phone call or canceled with less than 24 hour notice, there is not time to schedule someone else. No appointment means no work during that time slot. No work means the shop is losing money. Additionally, if parts have been ordered, returning and restocking those parts means added hassle for the shop and the parts distributor. Valuable time and money are lost and is upsetting for those of us who depend on it for our livelihood. That being said, we understand that sometimes unavoidable emergencies arise to which we will certainly be understanding and will gladly reschedule you. Try to be on time for your appointment and allot adequate time to discuss the vehicle’s issue. You must prepare to make decisions with your money, so this is not the time to be in a hurry. Be ready to share exactly what’s going on with your car, especially if this is your first time at this shop or you haven’t yet built a trusting relationship with them. Tell the truth – the whole truth – even if you are embarrassed by, for example, having put off repairs or an unsuccessful DIY project. The more information you are able to provide can help the mechanic get to the root of the issue more quickly and efficiently. Of course, if you have a trusted relationship with the mechanic and he/she is familiar with your vehicle and the problem, then this will likely be a much shorter conversation. When did you first notice the problem? How often does it occur? What does it feel like? What does it sound like (and yes, you can try to mimic the sounds – we won’t laugh!)? Ask questions, even if you think the mechanic or service advisor might find them to be silly. We’ve certainly never thought any customer’s question was silly. Know what the mechanic expects of you and make your expectations clear to the mechanic. We want you to leave knowing what will happen on both sides so that there are no surprises when you return to pay the bill and pick up the vehicle. __I REQUEST A WRITTEN ESTIMATE. __I DO NOT REQUEST A WRITTEN ESTIMATE AS LONG AS THE REPAIR COSTS DO NOT EXCEED $____. THE SHOP MAY NOT EXCEED THIS AMOUNT WITHOUT MY WRITTEN OR ORAL APPROVAL. __I DO NOT REQUEST A WRITTEN ESTIMATE. To be clear, we don’t need the government to make us treat you fairly. Even if someone selects the bottom option (“I do not request a written estimate.”) but still wants an update or a projected cost, we will still provide those things because it is our heart to treat you well. What matters to us is what you need from us, not the box you check on the form. However, those options do help to protect you in dealing with shops you’re not familiar with. A trusted mechanic will always talk you through what’s going on with your vehicle and provide space for you to ask questions. This can work whether you say, “Do everything necessary, and send me the bill,” or “Money’s tight, I can authorize $100 for diagnostic testing, but we have to have a conversation before anything else happens.” Again, the shop needs to honor your budget and give you the information you need. However, let’s say this is the first time you’ve had this shop do a major repair on your vehicle and you don’t yet have a trusting relationship with the mechanic. Then you might choose the first or second option so you can protect yourself from unexpected expenses. The mechanic or service writer will have to take time to research the parts and labor times before work is begun. If it’s a complex repair, this could take some significant time and delay the actual work. You scheduled your appointment, discussed the problem thoroughly with your mechanic or service advisor, and established expectations. You were informed at each major step in the process of the service and you have returned to pick up your vehicle. Did they provide good service and meet your expectations? Many shops, like ours, value customer feedback and referrals. What did they do well? What could they have done better? Be open with them and provide both positive feedback and constructive criticism. If you were pleased with the work and you plan to establish a relationship with them as “your mechanic,” a great way to thank them is by referring that shop to your friends and family. Many shops depend on those referrals in order to sustain and continue building their business so they can keep helping people like you be confident that your car will get you where you need to go.